St. Ann’s Church, Vilnius, Lithuania. St. Ann’s Church, built in 1495-1500, Vilnius, Lithuania. 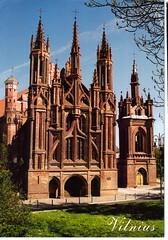 A Postcrossing postcard from Darius in Lithuania. Darius says that when Napoleon saw this beautiful church, he wanted to carry it out by hand to France. It looks amazing. Previous Previous post: Houston, Texas.